Portable digital piano with an 88-key Fatar’s TP/100LR keyboard with Premium Hammer Action and triple switch detection system that is more than a simple musical instrument, since it combines the performance of a state-of-the-art digital piano and a powerful master keyboard. It offers a powerful two-part sound generator based on the Studiologic TrS technology (True Sound), with 128-voice maximum polyphony packed in an elegant and solid metal case. A selection of 12 best in class sounds (2 x Acoustic piano, 3 x Electric Piano, Clavi, 2 x Pad, 2 x Organ, 2 x Bass) is easy to manage through a direct control panel. The instrument provides amazing piano sounds based on 9 dynamic levels interpolated in real time and loudness parameters. The new sounds are further made very natural and realistic by the new String Resonance modelling that allows to control and reproduce all the real resonances found in an acoustic piano made by the chords, the damper and the soundboard itself. The piano further features three reverb effects (Room, Hall, Delay) and four modulation effects (chorus, phaser, rotary, tremolo), 50 user’s presets, an Effects Auto-set function, two-part Split/Layer with programmable Split point, plus other function including Transpose (+/-12), Velocity, Octave Upper or Octave Lower. It provides MIDI and USB connectivity, two 6.3mm mono jack audio outputs and one 3.5mm mini stereo jack input, inputs for hold and expression pedals. 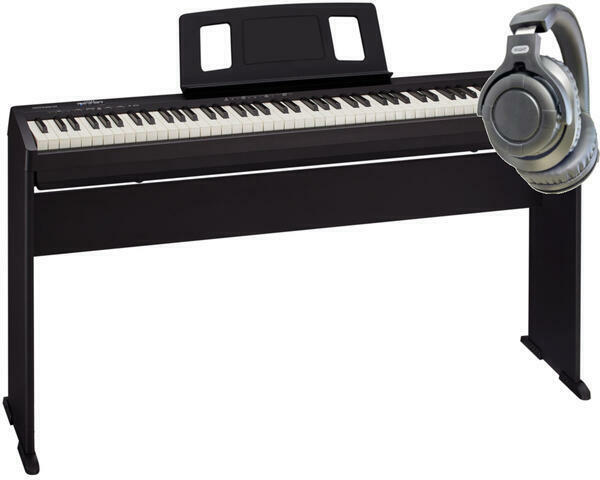 The Studiologic VFP1/10 sustain pedal, power cord and music stand are all included. Dimensions: 1300 x 310 x 150 mm. Weight: 13 kg. Black colour. Do you own Studiologic Numa Stage or have you had a chance to try it?